Take a browse and you will find a variety of parts that will transform your 370Z from a stock ride to a show BEAST! All parts are available in fiberglass or carbon fiber, with some pieces offered in partial carbon fiber. All of our parts are made to order locally, with normal production lead times of about four weeks. We do not stock any parts. To get a more specific lead time, please Contact Us prior to placing your order. Shipping for individual items can be selected during checkout, but for combined shipping please Contact Us prior to placing your order. Happy Browsing! 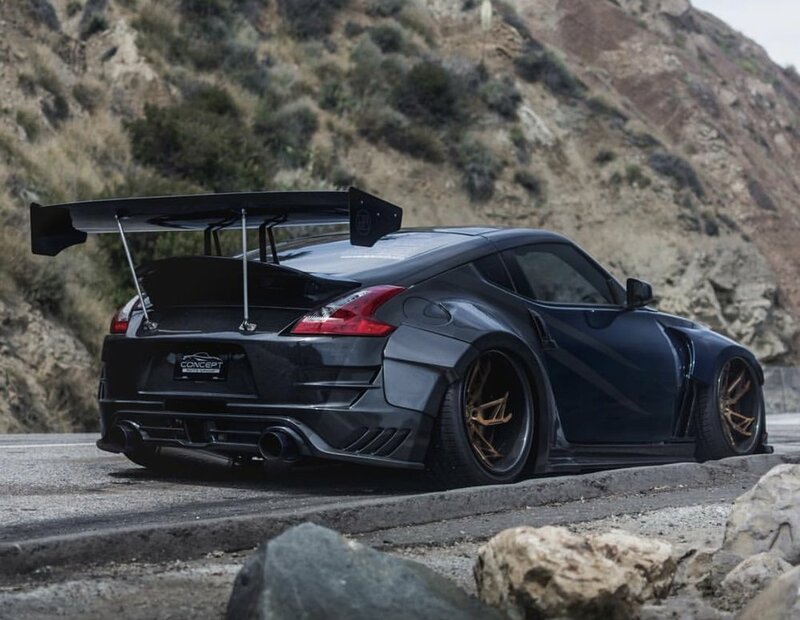 Our Niko Edition Widebody Kit for the 370Z is an exclusive numbered edition kit. We offer fitment options for OEM, NISMO, Amuse, Zele & Weber Sports Body Kits. The kit includes: 8-piece over fenders, RS1 vented front fenders and replacement side skirts. All the pieces overlap and work together to create the look. Ideal wheel fitment for the kit for a flush, non-cambered look is 20x10.5 +0 front and 20x12 -45 rear. This is just a "baseline" fitment, and depending on tire size, brakes, suspension type/settings, etc. - wheel sizing will differ. Please note you will need to cut front fenders; and cut, weld and seal rear quarter panels to properly install the kit to allow wider wheels. The flares can be attached via silicone/epoxy; or bolted on with a combination of rivet nuts and bolts. No hardware is provided with the kit, but can be purchased separately. Available in full fiberglass or full carbon fiber.